Stoke City are on their way to surviving a third consecutive season in the Premier League. They have so far finished 12th and 11th and look on course to be 10th or thereabouts, although things are tight and a mere six points separate the bottom club Wigan (27 points) and Everton in 10th place (on 33 points). 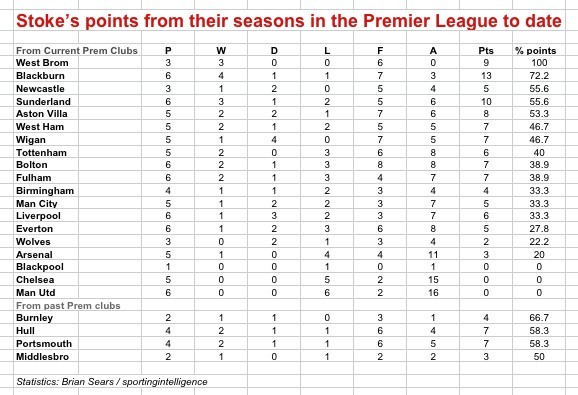 Stoke’s record of points won in the Premier League, by opponent, is recorded in our full table below. In six games with Manchester United, five games with Chelsea and one game with Blackpool they have yet to win a single point. They have also won a third of the points available or fewer against Arsenal, Wolves, Everton, Liverpool, Manchester City and Birmingham. But in three games against West Bromwich Albion, Stoke’s record before the Monday night game against West Brom = 100 per cent, with three wins from three, six goals scored and none conceded. This represents a 100 per cent points record against the Baggies, with Stoke’s next best percentage tallies coming against Blackburn (72.2 per cent), Newcastle, Sunderland and Aston Villa.